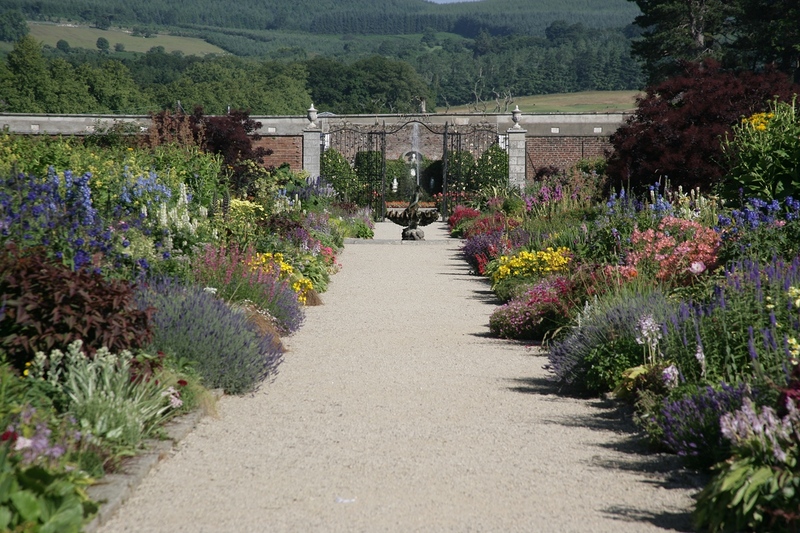 Ireland’s Powerscourt features perennial borders. My recent trip to Ireland included a visit to Powerscourt, the estate in Enniskerry, County Wicklow, whose long history dates back to the twelve century. The extensive garden at Powerscourt contains many wonders, including two long perennial borders, that have made it one of Ireland’s treasures. During the nineteenth century the walled garden’s perennial borders were installed. They reflect the gardening world’s interest at that time in perennials rather than annuals. When garden writer William Robinson (1838-1935) and later garden designer Gertrude Jekyll (1843-1932) both encouraged gardening with perennials, borders of perennials became popular in the English garden. Powerscourt includes other areas of nineteenth century garden style like an Italian garden in the terraces that link the house to the lake below. The terraces were constructed between 1843 and 1867. The design of the garden reflects the desire to create a garden that is part of the wider landscape. You can view the garden from the upper terrace where you can enjoy the harmony among garden slops, terraces, flower beds, trees, and the lake. What caught my attention was the extraordinary collection of plants in the walled garden of perennials. The fact that they are of mature size, well maintained, and number in the hundreds certainly contributes to the spender of the present-day Powerscourt garden.